New Summer Gloves: REV'IT! Strikes Again! A couple of weeks later my father had calmed down considerably as he explained his gift, “Your mother and I cannot stop you from learning how to ride a motorcycle but you cannot own one while you are living under our roof.” The gloves were his way of compromising with me. The irony of this whole situation was that my parents met in college when dad gave mom a ride home from their summer job on his motorcycle. I am pretty sure my grandfather was not too keen on my father after that. The Olympia gloves got me through my rider-training course and my collection of motorcycle gloves has grown ever since. For the past few years I have been using Rev’It!’s Monster gloves, and while they have served me fantastically, they are about ready for retirement. Rev’It! is going to have quite a few summer gloves debuting this spring that will prove to be excellent options for anyone looking for some new mitts. For 2014, REV’IT! has updated versions of two of their staple gloves in the men’s lineup as well as introducing two all new offerings for warmer weather. The Bomber is an updated version of my beloved Monster gloves while the Dirt 2 replaces the Dirt. The Roadstar GTX and Vapor H20 are two all-new waterproof summer options for the rider that does not let a little rain stand between him and two wheels. The REV'IT! Bomber Gloves set itself apart from the Monster with increased airflow, flexibility, and protection. Airflow is upgraded via extra perforation at the fingers and palms while simultaneously increasing protection with the addition of a palm slider. Stretch ridges were updated on all fingers but the pinky and elastic was added at the wrist to help the glove move more naturally. 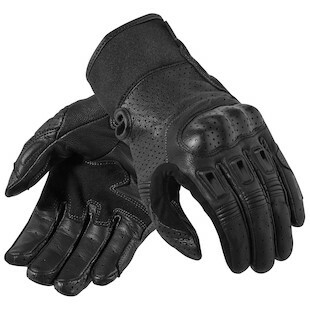 The Bomber is a short cuff glove with a combination goatskin and synthetic leather shell, TPU knuckles, and finger armor. This glove is my favorite all-arounder, as it fits perfectly with literally any bike in my garage. The Dirt glove is another staple in Rev’It!’s lineup which is getting a facelift for 2014. 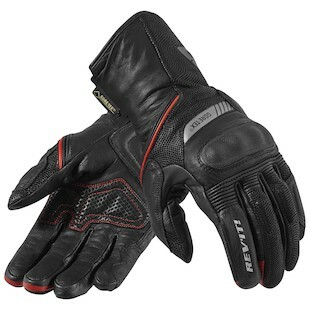 With better impact protection, increased airflow and tactile sensation as well as a connective finger tip for use with touch screen electronics, the REV'IT! Dirt 2 Gloves are a no brainer for current fans of the Dirt glove. TPU hard-knuckles, PU rubber palm sliders and finger armor keep your hands safe from even the most aggressive dual-sport rides. Ventilation panels were increased at the fingers, thumb, and back of the hand to keep you cool in even the most extreme heat. Handle bar grip and feel is second to none with an air stretch mesh and goatskin outer shell with stretch panels in the fingers and upper hand as well as a grip patch on the palm. If you are looking to upgrade protection for your next adventure, and need a glove that can handle whatever might come your way, the Dirt 2 has you covered. 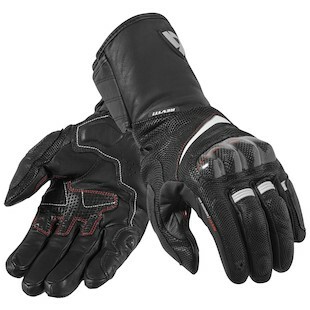 The all-new Roadstar GTX is set to be Rev’It!’s flagship touring glove in 2014. Waterproofing is provided via Gore-Tex with X-trafit. X-trafit technology is a special way of binding the polyester liner, Gore-Tex membrane, and outer goat and cowhide shell to offer the rider the highest levels of tactile grip and feel. Protection in the impact areas is provided by TPU armor and cowhide covered hard knuckles. Adjustment straps at the cuff and wrist allow for a snug and secure fit while stretch ridges at the fingers, back of the hand, and the thumb allow for maximum flexibility. As the REV'IT! Roadstar Gloves are meant to handle any amount of rain Mother Nature can throw at you, they are finished with a visor wiper on the left hand. For anyone looking to outfit themself for an upcoming trip or just want to step up your protection on the daily commute you will be hard pressed to find a better option. If you like the idea of the Roadstar GTX’s but want a slightly sportier fit and style, Rev’It! is introducing the Vapor H20 gloves. Expanding on Rev’It!’s popular winter line of H20 gloves the Vapor H20 is an all new summer offering which utilizes Rev’It’s own hydratex waterproof membrane. The Vapor H20 also incorporates mcFit technology which works like Gore-Tex’s X-trafit to offer the highest level of tactile feedback to the rider. The shell is a combination of goatskin, leather, and stretch fabrics designed to give the REV'IT! Vapor H20 Gloves a slick race fit. Carbon fiber knuckles contribute to the sport styling while PVC armor and TPU palm sliders keep your hands guarded in the event of a crash. Like the Roadster GTX the Vapor H20 also features adjustment straps at the wrist and cuff. 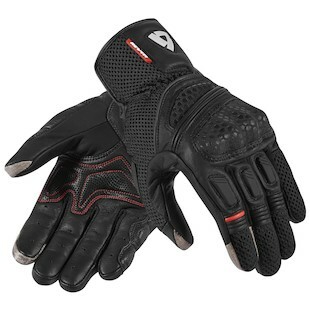 If you are sport bike rider whose fun does not stop when the rain begins, the Vapor H2O’s should be on your short list. Motorcycle gloves have a special significance for me, as they were the first piece of gear I acquired when learning to ride. What my parents did not know as they gifted me those birthday gloves is that I had already signed paperwork on a brand new Triumph Bonneville T-100. I had made arrangements with Hermy’s Triumph up in Port Clinton, PA to store the bike for me until I completed my MSF course. Nine years later I still have that Bonneville and she has taken me on some of the best experiences of my life. Anyone who rides a motorcycle, regardless of shape, size, and style, can appreciate the magic that comes with traveling on two wheels. Whether you are heading back and forth to the office or taking a coast-to-coast, 4-week romp, there is a bike out there for you. Rev’It! has done a fantastic job of creating offerings to suit any riding style or ability. Whether you have been riding for years, or you are just starting out on your two-wheeled journey, there is no substitute for proper safety gear. I would recommend starting with your gloves.